While Line 1 is the largest north to south line in Shanghai, Line 2 is by far the biggest and busiest east to west subway connection in the city. Line 2 can be easily identified by its light green identification color on most subway maps. It connects the western lying Qingpu District with the Pudong International Airport in the east. The subway winds it way over 60 kilometers underground and stops at many of Shanghai’s important cultural and commercial centers. 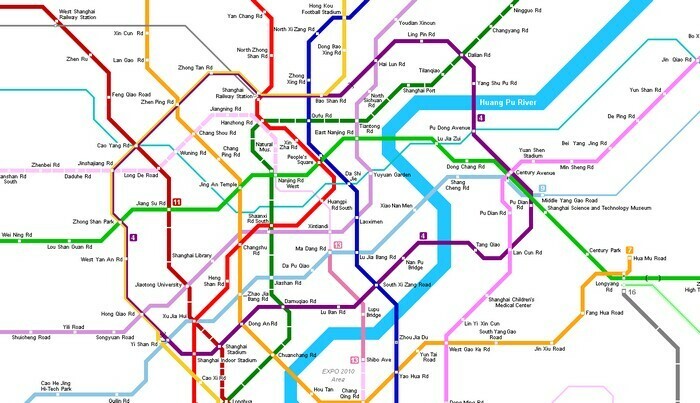 Stations can be found at Zhongshan Park, Jing’an Temple, People’s Square, the Lujiazui Financial and Trade Zone, Century Park and many, many other locations. If you are flying into Pudong airport and would like to take the metro into the city, you will find the beginnings of Line 2 between Terminal 1 and Terminal 2. Note that the train coming in from the Pudong airport is a slightly separated from the other main part of Line 2. Those passengers coming in from the airport will have to change trains at Guanglan Road to continue down Line 2. The line can also be taken to the Hongqiao Airport as well. Transfer to Line 7 at Jing&apos;an Temple or Longyang Rd. Transfer to Line 11 at Jiangsu Rd.